It started with the usual lack of sleep, however I got over this quickly once I was dressed and ready to leave the house. I spent the morning so eager to get to the airport and get through security. We did an online check-in the night before so there was no faffing about when we got to the airport. However we still had hold luggage to be checked-in, but as we were already checked-in this took a matter of minutes. Going through security only took about 15 minutes and even that could’ve been less however one of our bags got kicked (rejected for a hand search). Nevertheless this was only due to a battery pack, but it didn’t x-ray properly so was rejected as an unknown object. The only wait that we endured here was the wait for the security staff to get to our bag as there were 3 in front of ours. Neither of us got stopped for a body search of any kind *yay * . So from check-in to Duty Free was around 20 mins and could’ve been less. This was of course helped by the fact that we had prepped our liquids bags before packing and had our electrical items ready to come out of our hand luggage to be x-rayed. So it really does help to be prepared as it stops you getting stuck in any delays, therefore there is no stress. Now comes the fun part, the V-ROOM! We had a very small breakfast at 5am so were very hungry as it was now 7am and we just wanted to relax before the flight. 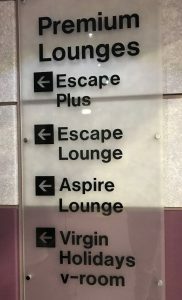 So in Terminal 2 at Manchester Airport all of the lounges are located next to JD Sports and it’s actually hard to miss the signs for them. We got the lift up and followed the signs round for the V-Room, however it was not open. Very confused we thought we would check the opening times online as we just (wrongly) assumed it would be open as soon as check-in opened. This was not the case, online (a Google search) it says that they actually only open the v-room at 7:30, so we went downstairs to kill half an hour. Though when we returned at 7:30 (or probably just after), us and a couple of other people stood, confused at the still closed V-room entrance. We waited for a moment as we thought they might just be running late, about 30 seconds later a female member of staff put her head out of the door and said “We open at 8:30” and retreated back in. There was no apology; there was also no sign anywhere to say when they would open. We found this very rude of the staff member, and very confusing that we actually couldn’t find this time anywhere; not in the emails we had, nor near the doors, the online time we had to go on was the 7.30am time that the Google search revealed. Still there is not a lot you can do in this situation. 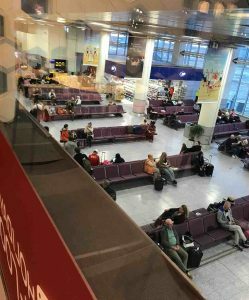 Once again we went back downstairs and went for a walk around Duty Free, had a look at sunglasses – since we had left mine in the car – and a nosey at what else was around. At 8:30 we returned for the third time to find the V-room open! Hurah! Despite the rudeness that we received earlier from a member of staff, when we returned to it being open we were welcomed in. Now we only paid £15 each for the V-room which was a discount, and even at full price it is worth it. The few hours we spent in there went so fast it was really nice. Due to where it is located you can sit and people watch and pass time nicely. 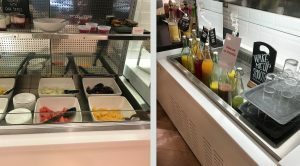 There is an array of food including but not limited to; pancakes (made fresh when you press a button, super cool), sausages, egg, bacon, beans, mini muffins, toast and a selection of sweet products. You can have any drink you wish, there is a coffee machine with LOTS of options, as well as tea, and there were about 6 different juice drinks and the option for Pepsi as well. As well as food and drink they provide entertainment, there is a foosball table, tablets with games on, and interactive area, magazine and TV’s and internet access included. The only thing available but not included was alcoholic drinks, but these seemed reasonably priced anyway. Various seating areas are available and it even has its own dedicated toilet area. 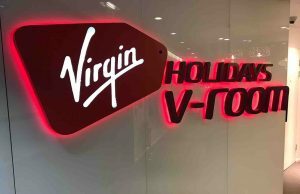 Newspapers and magazines are available, as are Virgin Holidays staff to answer any questions you may have. Overall it was a really nice experience and it really helped the time go much much faster whilst we were in there. I would definitely recommend this room to anyone who can use it, and I would recommend getting there as early as possible to get the best possible use out of the lounge. Previous Previous post: What will 2018 bring? Next Next post: Orlando Day 1: Disney’s Hollywood Studios.